With the enhanced design of the Vintner Series Individual Diamond Bin wine rack, each wine bottle is stored in an individual cradle, yet at a diagonal pattern, creating a very dramatic storage display for your prized possessions. Popular for kitchen cabinet wine rack. Purchase two to stack on top of each other to maximize the height of your wine storage. Assembly required. Individual bottle wine storage is our most popular style of wine rack. Now with this enhanced design, each wine bottle is stored in an individual cradle, yet at a diagonal pattern, creating a very dramatic storage display for your prized possessions. 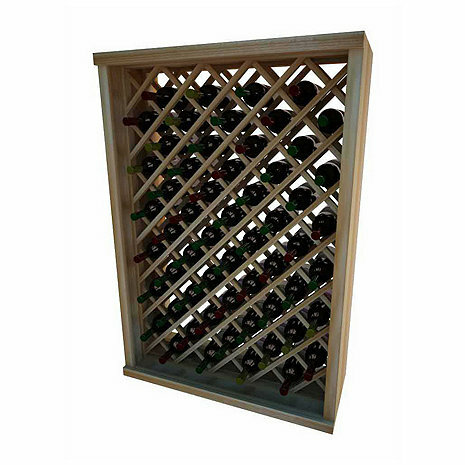 The Individual Diamond Bin wooden wine rack stores up to 58 wine bottles. Purchase two to stack on top of each other to maximize the height of your wine storage. Moldings and platforms sold separately. Is this complicated to put together? I am a female and not handy. BEST ANSWER: The Napa Vintner Stackable Wine Rack - Individual Diamond Bin does require assembly but it is not complicated. The rack comes with instructions and you should be able to assemble this yourself, maybe have a friend help you as it is always helpful to have another pair of hands. While there is a decent amount of assembly required, it wasn't hard to do. I am not handy either. You can do it. the wine rack comes with good instructions for the assembly - it is not very difficult. Can this be turned on its side and stacked two high? BEST ANSWER: I purchased two diamond bins and use them stacked horizontally on top of each other. the smaller diamond bin (#6124919) is stacked it on top of the larger diamond bin (6064904), both turned on their sides. for stability, I bolted them together - the combination works well (and they are full of wine).